ATTENTION: Pretty mommies out there!!! 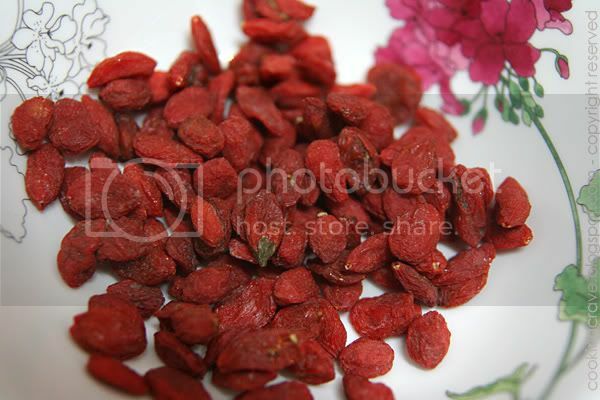 Let me introduce to all of you this very nutricious, delicious, easy and simple dish. 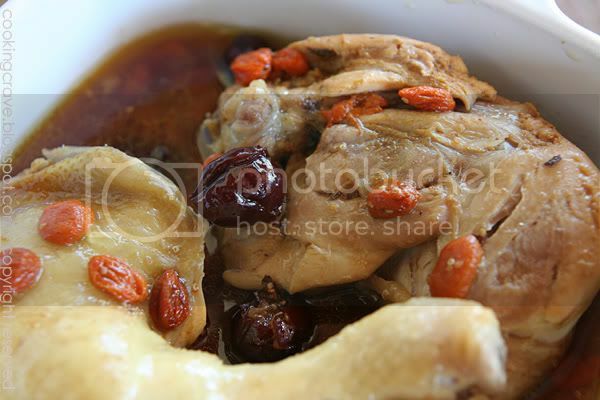 When I first visit a Chinese Acurpunture Master few years ago, I got introduce to this dish by him. When I first saw his 63 years old wife at his home that time. I was wondering how she could maintained her good health and beautiful skin, she doesn't look like a 60 years old lady at all. Her face are free of wrinkles and freckles. Her face and neck look so firm and both her cheeks are rosy red in colour. I asked him half jokingly "Wow, what your wife eat, she look so young & pretty???" He smiled and tell me, "It's easy, let me teach you a simple recipe and my wife cook this most of the time" .... that's this simple & easy Double-Boiled D.O.M Chicken☻. Wolfberries & red dates are used for this dish. 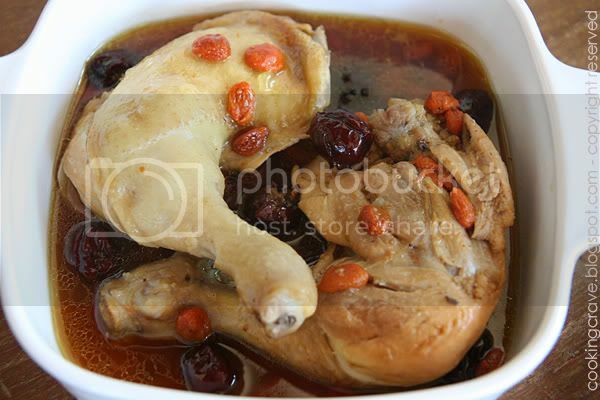 Chicken drumsticks in the double-boiled pot with all the ingredients. This dishes are suitable for those who are in their confinement too, just add in a few slices of ginseng & cook it on low fire for longer time. Remove all the fat you can see on drumsticks and raise it to clean with water. 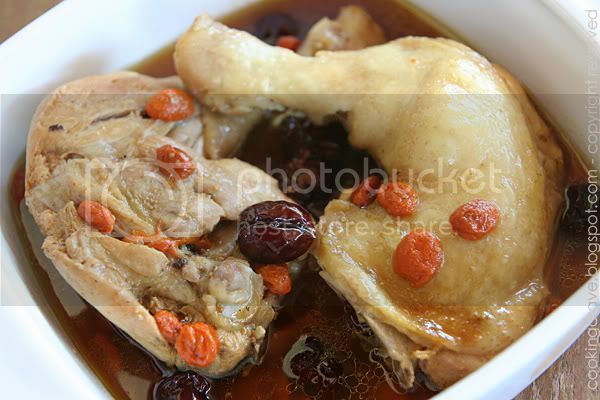 Place the chicken drumsticks into the double-boil pot. Add in ginger juice, D.O.M, water, sesame oil. Raise the wolfberries and red dates before add into the pot. Cover the pot and cook the chicken on high heat until the water at the lower layer of the double boiler are boiling. Lower down the heat and continue to cook for about 40 minutes. Switch off the fire and place the chicken drumsticks on a bowl. Stir in some salt into the chicken soup and pour the soup onto the drumsticks. Serve hot with or without rice. 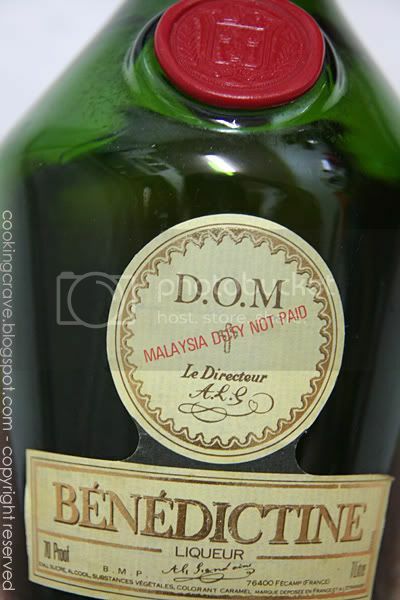 Giggle: All the while the recipe is using D.O.M one. I've never tried using RUM. But, I think RUM is more suitable for baking. oh... this D.O.M Chicken really look great! I gonna try it man! Lovely alchohol chicken! i keep thinking of this yummy dish, Amy... hmm wonder if yomeishu can work or not..
Bigfish: I'm having some internet problems here ~ slow connection. Will post up the recipe for you once my connection are back to normal :D Pls wait okay! Fad Mom: I don't know about Yomeishu..but you can try it if you want. just wonder why the salt must put in last?